The staff was taking suggestions for free updates over at another site, but maybe some L-Netters have good ideas too. 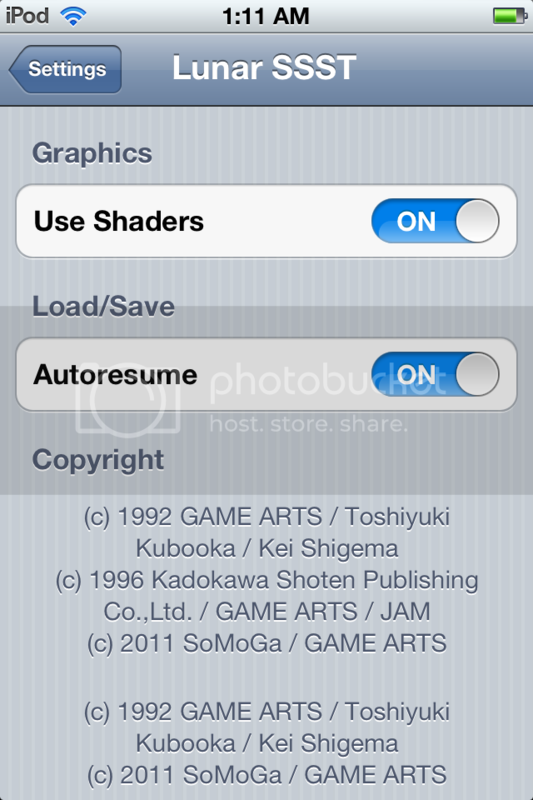 - Ability to show/hide statusbar. - Ability to select language just for audio track, and not entire game. Ok so I just post my suggestions from the other thread? 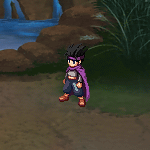 - When using magic on a character, and select the character with the d-pad, the cursor just doesnt seem right. - The character moves a little too fast! It's the same speed as the original game, but too fast for an iphone to control easily. - An option to switch between low and high frame rate would be nice. I personally would like the option of subtitles (instead of voices, I mean, not in addition) during the cutscenes, but I expect I'm in the extreme minority there, at least among those who can hear. Due to workload I still haven't gotten back to it and therefore haven't been in a battle, but I wonder about battle voices. "Check this out!" I have taken some screenshots of specific parts of the game that I wish they worked with! Some of these I already mentioned them in my last post here but now I have a screenshot to be more clear. Use the healing spell from the menu. Look at where the cursor is, it's selecting Luna. But it's actually selecting Nall! It's just invisible until you move the virtual d-pad to the side. 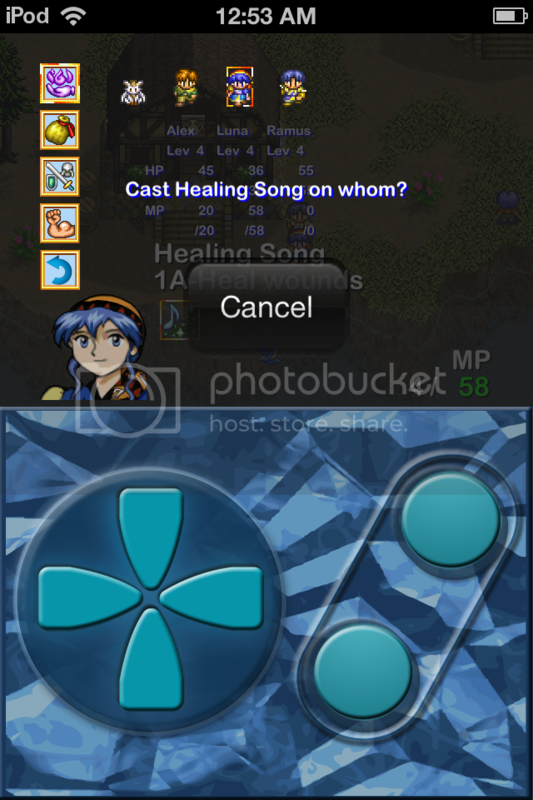 Or manually touch the sprite of the character you want to heal. But I would prefer to do it with the controls. Edit: Oh and most importantly, why is the HP hiding in the dark when i'm about to heal?? And that text is almost completely on top of the heroes' HP. And... the sound when you heal in the original game is not here. It just sounds like when you open a sub-menu. When you go buy equipment, select 1 character, Luna for example. Then switch to Alex and press the button. Luna's face remains, but Alex is selected. Though if you move to another weapon the face will update. This one is really minor but some text just got cut in the item's description. Ok this one is interesting. Compare the two screenshots, and you will see that when you're outside the menu, the graphics become filtered with a soft blur, while inside the menu everything looks pixel perfect! The blur doesn't look bad at all, but if the game can handle 2 modes, it would be nice to just have an option to filter or not. 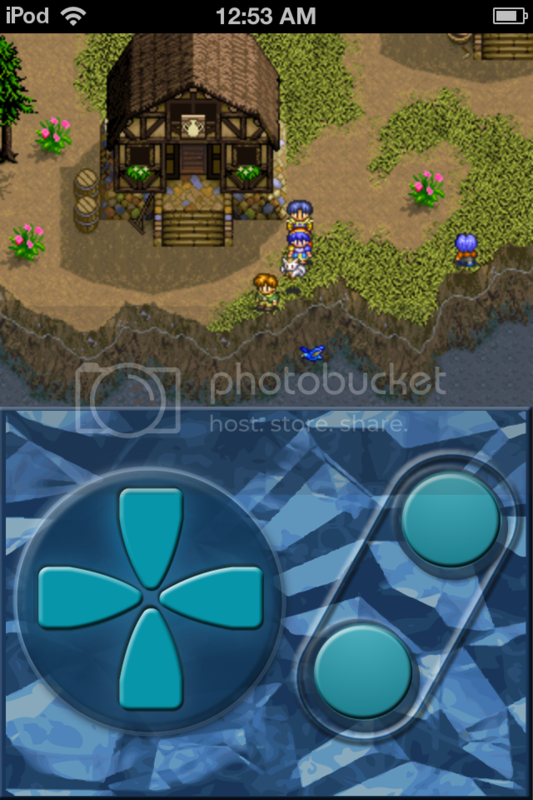 Some might love to see the game in it's pixel glory ^__^ me included. The loading screen. I can't find my playing time. Is it shown anywhere in the game? If you look in your device's settings, there's an option just for Lunar SSST! And these are the options. I'm curious about what "Use shaders" does. I tried on and off but I didn't notice a difference. Maybe it had something to do with the soft blur filter? That's it for now. I hope they see all of this and fix it!! 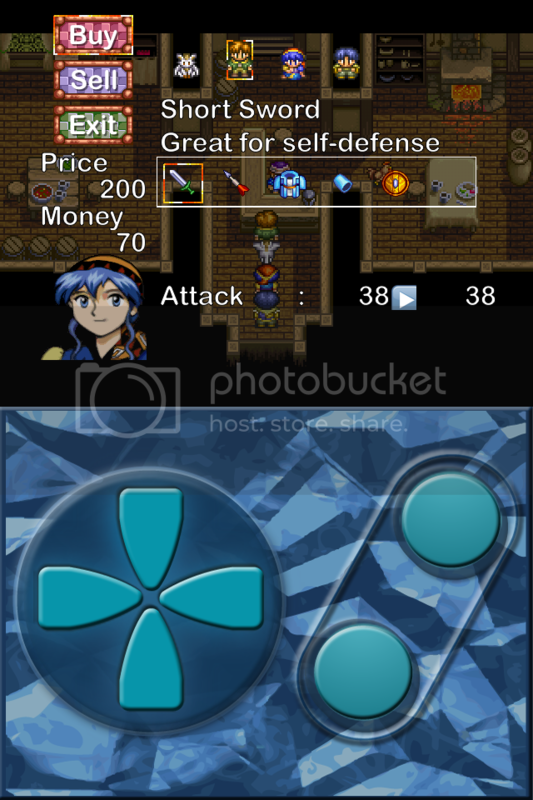 Also, did anyone notice how the icons in the items menu and battles, and faces, seem to be taken from the PC version which had higher resolution and nicer looking icons/faces? Really a nice touch!!!!!! I'm glad they did that. DevNall wrote: The staff was taking suggestions for free updates over at another site, but maybe some L-Netters have good ideas too. What's that other site where they were taking suggestions? There's a toucharcade thread with people doing suggestions but not sure if that's it. 2) Automatically hide the on-screen controls when using the icade. Well we're on update 1.2.0! Why must the framerate be slow? It is the only game with slow framerate that i have ever seen! I see games both in 3D and 2D with complicated textures and features, yet they look very smooth like 60fps. Why can't Lunar???? There's just no excuse. All right, now that I've actually spent some time playing with this, here are a few notes. I haven't even de-fogged the Weird Woods yet though so these are pretty early. 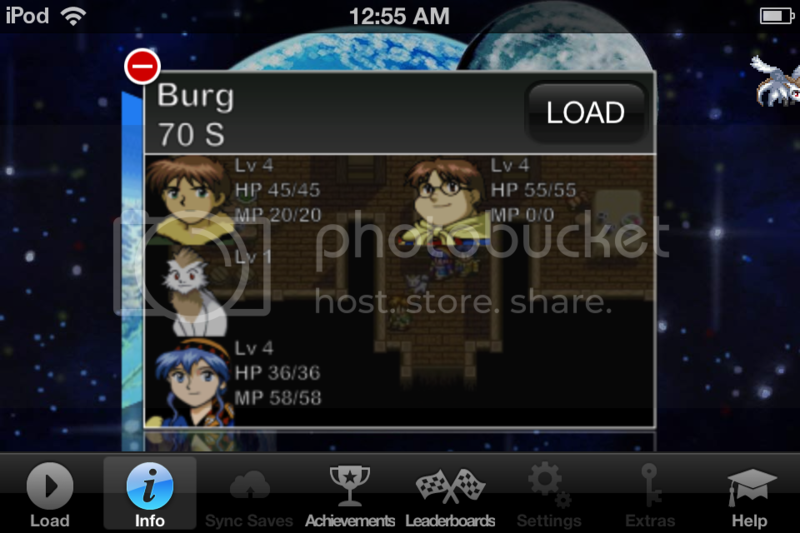 When buying weapons and armor at Burg shop, the sprites don't update to show whether that character can equip items. That is, when Buy -> Alex -> Short Sword is selected, Alex's sprite stands and walks in place to show he can equip that, but if I move to Luna or Ramus, they remain sitting (and Alex remains walking), even though they can both also equip the Short Sword, as their stats indicate. 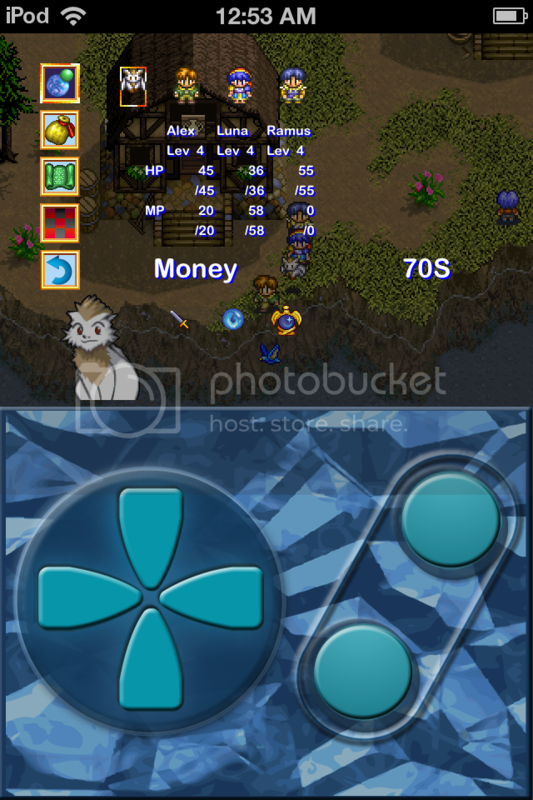 The SSH locations were used, and the SSH item, monster, and spell names, as has been noted. But this conflicts with using the SSSC dialogue as some locations and items are named in the dialogue. Ex. Honmel Isle (several lines in Meribia mention Caldor, per my notes) and of course Ghoto Woods; Knife (if you haven't equipped the items from Alex's house by the time you talk to Ramus next, Nall reminds you that you have a Dagger to use). Thanks to the opacity of fingertips, it's hard to tell which enemy is being selected to target sometimes. This messed me up when a Slime was right behind an Albino Baboon, I mean a Snowsquatch. Edit: After getting wiped out a couple of times in another dungeon I realized that if I switched to the smaller view, with virtual gamepad, I could use that to select the monster I intended to target instead of trying to hit a narrow slice of pixels with my fingertip. Still, it's annoying to have to do this for one phase of occasional battles. Level-up stats disappear very quickly, rather than waiting for a tap. I wish there was also a message that a new spell had been learned. After battle in the White Dragon Cave, sometimes the ice pillars flicker, as if that layer is being redrawn after the rest. And *sigh* they didn't fix what Alunissage mentioned relating to SSSC dialogue mixed with SSH names/locations. Yet I have one more suggestion. They likely will not get to fix this, I will explain why but I never lose hope! When you are in the menus or in battle, well, on the PS1 Lunar1, you could easily tell where your cursor is, because all other options are darkened. So here I made a comparison of what that would look like. It's a LOT better if it was like the picture below. Just the square outline rotating colors doesn't make it easy enough to see which option is selected. I can see why they didn't darken all the other options though. Because it's an ipod touch game! And the devs probably wanted the player to know that all options are selectable. But the game allows controllers, and has a controller mode, so there should be an option to enable/disable darkening the icons somehow!! That way when playing with a controller, or in portrait mode, you never have to come close to the screen to see what option is selected. Also, hope you enjoy my hidden, three armed mutation of a character.